We were mighty excited by the recent announcement of Panasonic’s world-first Micro Four Thirds system camera, the Lumix DMC-G1, and our interest has peaked even higher with the news of their forthcoming Panasonic LUMIX G digicam which adds high definition video to the mix. In case you missed the hoopla about the Micro Four Thirds system, it’s a standard created by Olympus and Panasonic for compact digital cameras which shares the image sensor size and specification with the Four Thirds System (as seen in the Olympus Evolt E-410 camera we reviewed favourably last year). 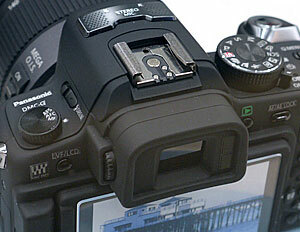 The smaller camera proportions means that the lens mount has also been reduced, but this puts the kaboosh on full interoperability between the two Four Thirds systems: although Four Thirds lenses can be used on Micro Four Thirds camera bodies with an adapter, it won’t work the other way around. Which is a bit of a pain. 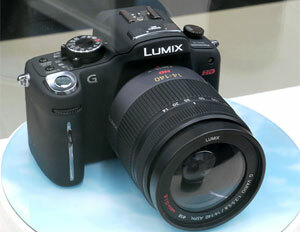 Panasonic announced the first Micro Four Thirds camera, the Panasonic Lumix G1, an attractive looking camera packing a flip-out 3 inch high resolution (1.44 million pixels) Live viewfinder, 12.1 megapixel Live MOS Sensor, Optical image stabilisation (MEGA OIS), intelligent ISO, AF tracking, face detection, HDMI output, and intelligent scene selector with Venus Engine HD image processing and a Supersonic Wave Filter dust reduction system – and all that in a camera body measuring just 124 x 84 x 45 mm (4.9 x 3.3 x 1.8 in). Although there’s been no full reviews yet, an initial preview on DPReview was very enthusiastic, with the authors declaring themselves “hugely impressed” by a “mature and ‘sorted’ product” and excited by what Micro Four Thirds promises for future camera designs. In this latest development, Panasonic have shown off a prototype of the LUMIX G Micro FourThirds system camera which the company claims will be the world’s smallest High Definition system camera. Expected to be released later this year, the G1 bears more than a passing resemblance to their G1 and sports a stereo microphone on the top and a dedicated a red button for HD movie capture. More information should be revealed at the upcoming PMA 2009 in Las Vegas (Photos: courtesy LGC). On a related note, Olympus has just announced the development of a new Four Thirds system DSLR aimed at advanced amateur photographers to be positioned between the E-3 and the E-520 models. The new camera will employ some of the E-3’s pro features like advanced high-speed 11-point autofocus system, onboard image stabilisation system with up to 5 stops correction, and enhanced weather protection. Previous Previous post: Carphone Warehouse To Become UK’s #1 ISP?